As of August 1, 2012, Elsevier has discontinued publishing Paramedic, EMT and Fire titles in its Emergency Medical Services product line. 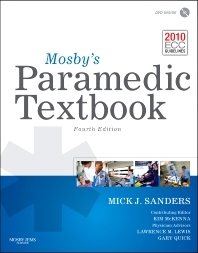 All Student Resources for these products can now be accessed at: <a href="http://ems.jbpub.com/sanders/paramedichttp://ems.jbpub.com/sanders/paramedic">http://ems.jbpub.com/sanders/paramedic</a>. All existing instructor-led courses prior to November 1, 2012 will remain active until September 1, 2014. More than 1,000 illustrations -- including 150 that are NEW -- accurately present different techniques and skills. Chapter openers, objectives and key terms set the stage for learning. Advanced Life Support (ALS) skills are presented step by step and in full color. Critical thinking questions help in understanding concepts and in applying them to patient care. A summary and a list of references in each chapter make review easier. A herbal appendix in the pharmacology chapter provides access to herbal content. Drug monographs on the Evolve companion website include Mosby's Essential Drugs, with instant access to comprehensive, up-to-date information on the medications that are administered by paramedics as well as those most commonly prescribed to patients. 3. Injury Prevention and Public Health NEW! 8. Research Principles and Evidence-Based Practice NEW! 16. Scene Size Up NEW! 20. Secondary Assessment and Reassessment NEW! 23. Diseases of the Eyes, Ears, Nose and Throat NEW! 33. Nontraumatic Musculoskeletal Disorders NEW! Appendix: Advanced Practice Procedures in Critical Care NEW!